With 2019 only weeks away, the world is abuzz with new year’s resolutions. If you’re feeling a bit overwhelmed by your resolution list, here’s a look at a few easy ways to stay healthy in the new year that will save you time and money. Got 10 minutes? That’s how long it takes to perform high intensity interval training (HIIT)—and you don’t need a personal trainer or fancy gym to do it! 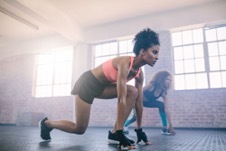 HIIT involves a 30-second spurt of high intensity cardio like sprinting followed by a minute or two of walking or jogging. This simple cycle of sprinting and walking is repeated for 10 just minutes. That’s it! Most amazing of all, this super-efficient workout style seems to offer the same health benefits as long-term aerobic exercise, such as jogging for an hour. Be sure to check in with your doctor first to ensure you are ready for interval training. The research is in, and you don’t need to starve yourself to lose weight. Counting calories is not the answer—eating the right foods is. According to clinical research, people who followed a low-calorie diet lost significantly less weight than people who consumed low-carb, high-protein diets. Low-carb diets are not to be confused with no-carb diets. Carbohydrates are not the enemy. The trick is filling up on fresh fruits, veggies, whole grains and proteins while avoiding sugary drinks, chips, cookies, and other refined carbs. The health benefits extend far beyond weight loss, reducing your risk for diabetes and many other health problems. We never tire of hearing about the health benefits of gratitude. Countless studies all lead to the same conclusion, that feeling thankful on a regular basis is a powerful mind-body cure-all. Gratitude does it all, from lowering your stress and blood pressure to reducing your risk for disease. Grateful people actually report fewer aches and pains and visit the doctor less. An attitude of gratitude is also attributed to professional success, the formation of friendships, boosted happiness, lower rates of depression…and more! All of us at Skin Care Institute feel truly privileged to be your partner in wellness and beauty. We look forward to hearing from you soon! Learn more about our leading selection of aesthetic and wellness services by calling 918.948.9639 or scheduling your personal consultation today.